Keisuke Honda carried Japan to their first World Cup finals victory on foreign soil when he scored the goal that beat Cameroon 1-0 in a Group E match on Monday. 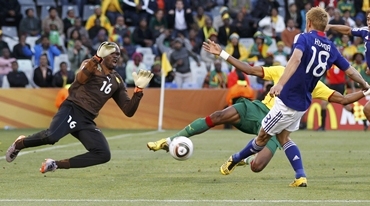 Paul Le Guen's Cameroon had been expected to ease to victory against an out-of-form Japan in what on paper appeared their easiest group fixture. But Takeshi Okada's Japan had other ideas and bustled their way to a deserved win to join the Netherlands as the day's Group E winners after the Dutch beat Denmark 2-0 in the early match. "Recently our team has not been delivering very good results and to be honest the mood was not the best but...our team delivered our best and this very good result today," man of the match Honda told reporters. A dour first half was briefly illuminated by Honda's 39th minute goal. Daisuke Matsui was allowed time and space on the right wing to float in a cross that evaded everyone but Honda at the far post, who finished neatly. 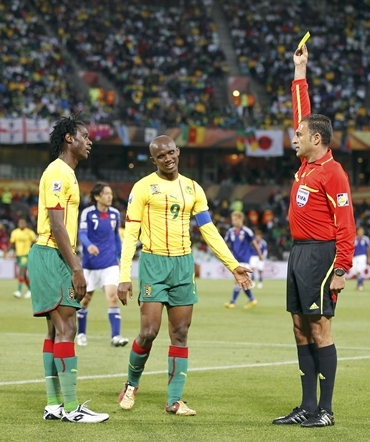 Cameroon had registered the game's first shot on goal shortly before Honda's strike but the Indomitable Lions failed on too many occasions to feed the ball to their front three. Cameroon improved after the break with captain Samuel Eto'o beating four players down the right wing before setting up Eric Choupo Moting, who curled his shot wide of the far post. Cameroon's Stephane Mbia hit the bar late on with a rasping 30 metre drive but the African side, who left normal first-choice midfielder Alexandre Song on the bench, did not threaten enough as Japan left Honda up front while the rest defended their lead. Japan will again be underdogs in their next match against group favourites the Netherlands in Durban on Saturday. "The next game we will be up against the Netherlands so we have to go further. This is the first win for us on foreign soil, but this is not an achievement for us at all, what is coming next is the point," Japan coach Okada said. "Today our players have done a good job but what we have to do against the Netherlands was the immediate thought that I had after the game," he added.